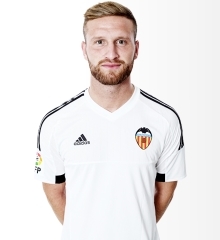 Bayern Munich want Valencia's Shkodran Mustafi to reinforce their squad this winter transfer window. The Germans have a quality squad with a lot of depth to it, but they've been exposed at the back this season and last for that matter and are looking to make some improvements there, with Shkodran Mustafi identified as the defender that can help improve their back line. Pep Guardiola is reported to favor the player as he is still very young and has room and time to grow and develop into an even better player, someone who could become a cornerstone player for Bayern for the next decade. Shkodran Mustafi has already garnered interest from other clubs as well, with FC Barcelona, Manchester United and Chealsea FC all interested in the player. With the market being short on high quality central defenders, Mustafi is seen as one of the best defenders right now with even bigger potential for the future.